In 2018, the S&P 500 declined for the first time in 10 years. The year’s 4% decline is obviously de minimis compared to 2008’s 37% plunge, though investors may feel it more keenly since the fourth quarter’s 14% decline erased what had been a profitable year. Nonetheless, the risk landscape changed dramatically in 2018 compared to the lethargy of 2017. 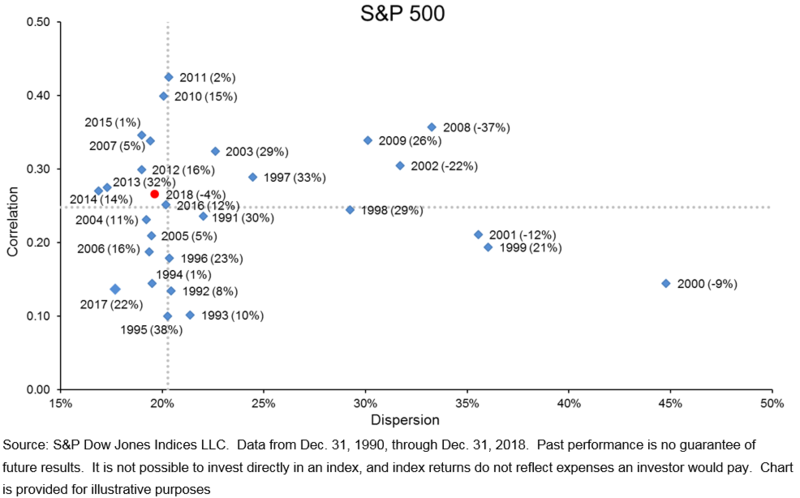 We find it helpful to view market volatility through the lens of dispersion and correlation. The graph below compares annual average dispersion and correlation levels for the past 28 years. Between 1991 and 2017, there had been only four years in which the index was down; all coincided with very high dispersion. 2018’s relatively modest decline occurred in a different environment – average dispersion for the year ran slightly below its historical median. The data suggest that while very high dispersion doesn’t guarantee a large decline, large declines have not occurred in the absence of very high dispersion. In December 2018 alone, the S&P 500 declined 9%, so it’s appropriate to observe that month’s data relative to other periods of market weakness. 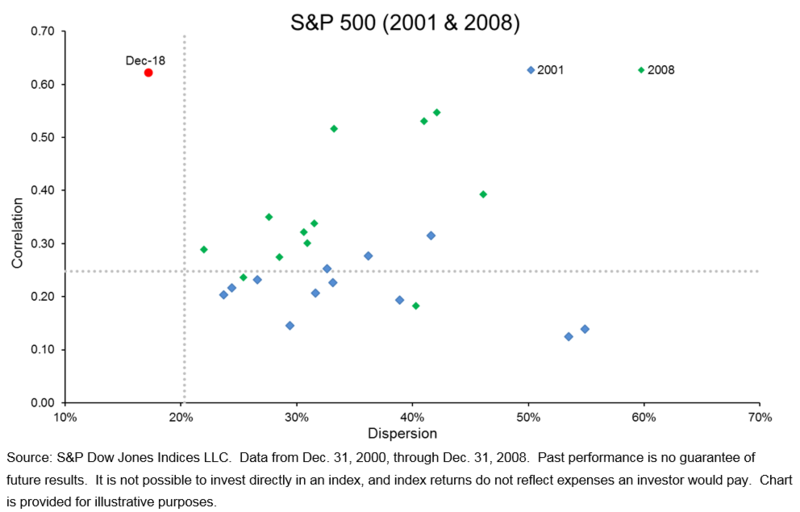 The dispersion-correlation map below juxtaposes December 2018 against monthly levels in 2001 and 2008. Even in December, dispersion lay below its historical median; the month’s surge in volatility was driven by a surge in correlation. Dispersion would have to rise dramatically to approach the levels we saw in the last two market crashes.